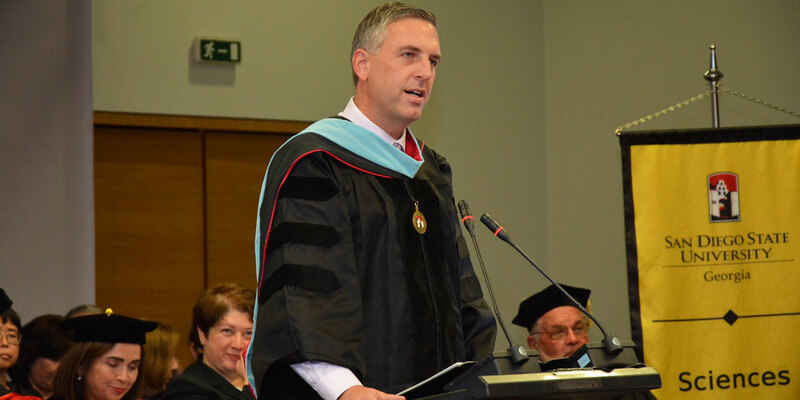 At the Convocation Ceremony of the 2018-2019 school year, MCC and San Diego State University in Georgia welcomed 230 new students pursuing STEM degrees in Tbilisi. MCC is devoting significant resources to help partner countries in Europe, Asia, and the Pacific transform the lives of the poor and catalyze long-lasting economic growth. Since its creation in 2004, MCC has invested more than $3 billion in compact programs in the region. MCC’s investments include projects focused on education, agricultural production and infrastructure – like roads, bridges, ports, electricity ­­– to enable long-term growth, reduce poverty and spur private investment. MCC has invested another $275 million in threshold programs in the region – smaller grants awarded to countries that may not qualify for compact funding but are firmly committed to improving policy performance. The program focused on improving the country’s performance on the Ruling Justly and Economic Freedom indicators and aimed to reduce corruption through reforms in tax administration, public procurement and business registration. In 2006, the U.S. Government’s Millennium Challenge Corporation (MCC) and the Government of Armenia signed a compact designed to reduce rural poverty through a sustainable increase in the economic performance of the agricultural sector. In December 2018, MCC’s Board of Directors selected Indonesia as eligible to develop a compact. The program sought to reduce corruption by bolstering several key anti-corruption institutions, and boost immunization rates through a decentralized and sustainable immunization management system. Recognizing that Jordan is among the world’s driest countries, Jordanians have been dramatically transforming their access to clean water and sanitation through a five year grant of $275 million provided to Jordan by the Millennium Challenge Corporation. The program strengthened democratic institutions by broadening citizens’ participation and increasing transparency and accountability in local governance. The program also modernized customs administration. In December 2018, MCC’s Board of Directors selected Kosovo as eligible to develop a compact. The program supported the government’s efforts to fight corruption and improve the rule of law through judicial, criminal justice and law enforcement reforms. In December 2018, the MCC Board of Directors selected Solomon Islands as eligible to develop a threshold program. The program aimed to reduce corruption by building a network of functioning and effective anti-corruption institutions and actors, and improve access to immunization services by creating a more capable and effective community health system. The program aimed to reduce corruption in Ukraine through better internal controls, monitoring and exposure, and judicial and regulatory reform. The compact focused on the rehabilitation and sealing of Vanuatu's two most important national roads, along with strengthening of institutional efforts and policy reform initiatives, to help reduce transportation costs.